Chennai's Popular Grill House Has A Special Iftar Menu With Discounts! Top rated grill house, Absolute Barbecue is a meat eater’s paradise and has a special Iftar meal going on along with some amazing discounts. With four locations across Chennai, getting a last minute reservation at Absolute Barbecue is a tough ask. Their concept is the same as any other grill house, like Barbecue Nation and Al Reef, but for some reason they manage to do things just a little better. For starters their price point is a little lower than their competition (INR 650 per person), and yet they manage to offer more variety than them. They follow the Teppanyaki grill concept and it is their range of starters that has won acclaim, thanks to the variety available. There’s mango mustard fish, chili garlic prawns, batter fried calamari, angara tangdi kebab, mutton gilafi sheekh, Jamaican chicken drumsticks and plenty more on the non-vegetarian side. There’s even a live counter with squid, octopus, shark and a few other rarer meats! For vegetarians, there’s less variety but definitely enough to feel like it’s worth it. 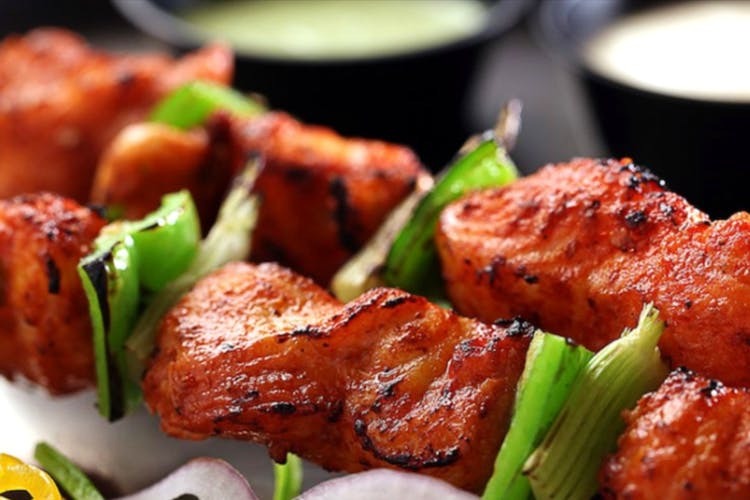 Churrasco pineapple skewers, malai paneer, paneer angara, mushroom skewers and a few others. We enjoyed the starters, each one was unique and the meat was tender and so was the paneer. If we had to pick, we’d say our favourites were the chili garlic prawns and the angara paneer. Moving past the starters things start to plateau as the main course buffet spread isn’t too exciting. The focus is on Indian cuisine, with a lineup of naans, rotis, biryanis, paneer butter masala, and other usual suspects. The value for money comes from the starters, especially if you’re non-vegetarian as the variety they offer is unmatched. Speaking of non-vegetarian delights, their T Nagar branch has a special Iftar menu that’s on till Thursday, June 14, which will feature all the traditional Eid special delicacies (mutton biryani to phirni!). Not only that, if you walk in after 10pm you get a flat 15 percent off on your bill just for the month of Ramadan! They have a second offer going too, called their early bird discount for dinners where if you walk in between 6:30pm and 7pm you get a flat 15 percent off on your bill! We think Absolute Barbecue is a great value for money restaurant that’s ideal for team lunches and other group events. Just remember to book in advance!